I can't understand the post at all. 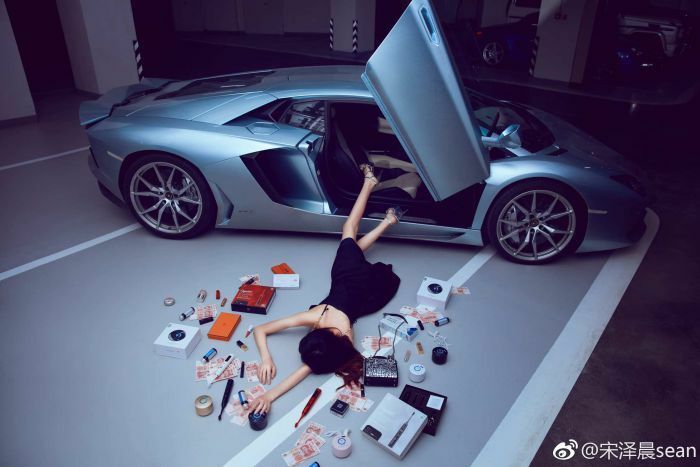 Photos of people lying face down on the ground — surrounded by luxury bags, shoes, and sometimes wads of cash — have gone viral on Chinese social media. 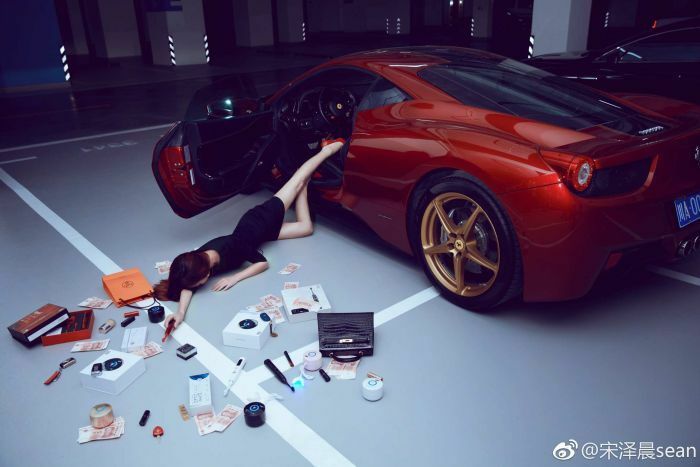 The bizarre trend — dubbed the "flaunt your wealth challenge" — has generated more than a million posts on Chinese social platform Weibo in the past two weeks. China's growing army of social media influencers have played a role in popularising the meme, sharing images of themselves participating in the challenge with their followers. 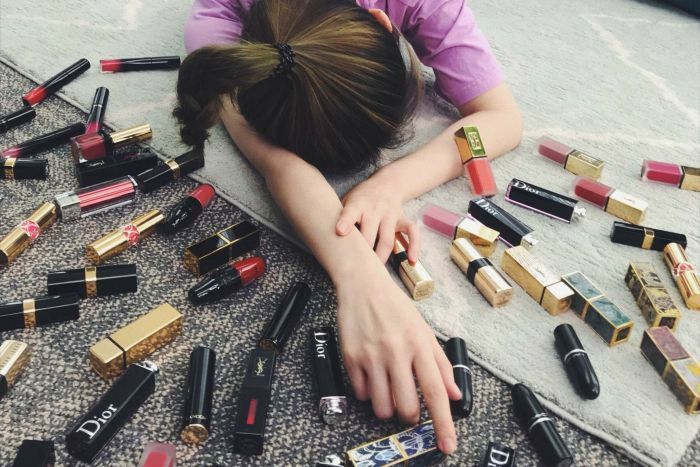 Dressed up in their finery, the influencers usually pose as if they've just fallen head first out of a luxury car and spilled their most valuable possessions onto the pavement. The trend has puzzled many an outside viewer as to what the appeal may be, and the increased attention has not been an all-round positive experience for the participants. Last week, one influencer had a friend shoot a video of her falling out of a car onto a pedestrian crossing in Taizhou, a city in China's eastern Zhejiang province. The video picked up more than 50,000 views on video sharing platform TikTok, according to Chinese state media People's Daily. 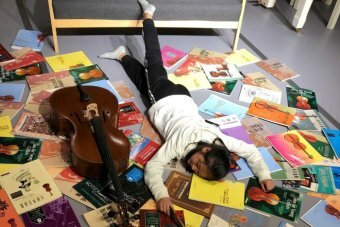 Pictures showed the woman, identified only by her surname Chen, lying face down on a pedestrian crossing with luxury items worth thousands of dollars scattered around her. The post attracted more than a thousand comments, with Chinese netizens questioning whether it was safe for the woman to be posing in the middle of the road. Local police later issued Ms Chen and her friend a small fine for parking illegally. 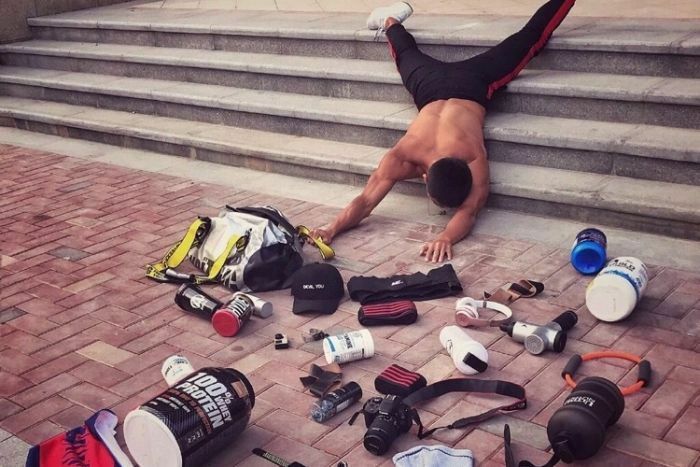 The global internet trend started in July in Russia after a DJ posted a photo of himself pretending to fall out of a private jet on Instagram. Since then, more than 100,000 Instagram posts with hashtags such as #fallingstars and #fallingstars2018 have been posted around the world. 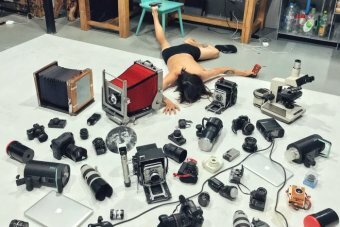 The craze has also sparked a series of satirical memes with netizens from all walks of life replicating similar poses with objects from their everyday lives. Some posts showed students falling over with books scattered around them, while apparent workers wearing hardhats posed with their work tools. 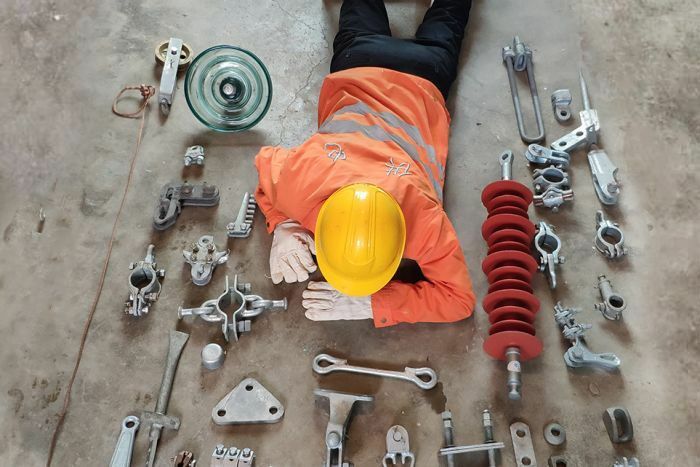 Chinese state-owned media outlets including the People's Daily and CCTV have since publicised some of these images, praising various workers for taking pride in their jobs. The act of showing off wealth also highlights China's rising middle class, who have increasing purchasing power. Chinese nationals accounted for 32 per cent of all personal luxury goods purchased around the world in 2017, according to a Bain Luxury study published by Bain and Company. Haiqing Yu, an associate professor at RMIT and an expert on Chinese digital media, said the challenge was a way for people from different backgrounds to express themselves online. "The Chinese middle class was the first to respond to the challenge, but it soon spread to [other less wealthy classes]," Dr Yu said. "It shows that digital media has become more widespread [in China] and that it's no longer only for people with wealth." Dr Yu said the development of China's economy had resulted in more people embracing technology as a way to express themselves. But at the same time, China has tightened its monitoring of social networks, she said. She added it was common for netizens to now express their feelings with photos on Chinese social media because text was more easily tracked and censored. "It used to be more straightforward in the past, but now [social media users] expect you to interpret the meaning of their photos," she said. "You can't overinterpret [the new trend] politically, but it could be related to China's political environment — under the present circumstances, people may be using this popular form of falling over to vent their feelings." How long would it take to build and what would be the cost of building a 56km bridge in Australia? My guess would be 50+ years and 3 trillion+. the chinese would bring in their workforce and get the job done. isnt that right pt? Seems your mob are onboard with the Chinese Isaac. Your obsession with China doesn't extend to being critical of the LNP getting in to bed with them. Foreign Minister Julie Bishop declined to comment on what was discussed at the Manila Quad meeting, but said "Australia, along with the US, Japan and India, supports greater investment in infrastructure in the region in order to enhance economic growth and connectivity". What is the point of that post Isaac, Australians are the most materialistic people in the world, are you saying Chinese don't have the same right ? CHINA has a concerning plan to infiltrate and interfere with Australia at the highest levels. And it has national security experts on high alert.ESPIONAGE and political interference by foreign powers is at unprecedented levels in Australia and poses a major risk to security, the nation’s spy agency boss has warned. Duncan Lewis, the Director-General of the Australian Security Intelligence Organisation (ASIO), told a Senate estimates hearing on Monday that he was concerned about escalating activities. “Hostile intelligence poses a real and potential existential threat to Australian security and sovereignty,” Mr Lewis said. In an era of high-level hacking attacks, assassinations on foreign soil, astro-turfing fake news campaigns and infiltrating attempts of the political class, one expert believes espionage is a bigger problem now than during the Cold War. The nature of espionage has changed rapidly, but in recent years China and Russia have ramped things up, said Professor Rory Medcalf, head of the National Security College at Australian National University. “The activities that would be concerning ASIO cover the full spectrum from risks associated with political donations through to old-fashioned espionage.”On the traditional end of the spying scale, Prof Medcalf said it was a “fair assumption” to make that a number of countries currently housed intelligence officers in their embassies and consulates in Australia. But a determined focus by China to influence and take control of the “tone and policy choices” of decision-makers in the West has been a game-changer for spying, he said. The rules and state of play of espionage across the board have shifted dramatically, particularly in the past few years, experts say. Dr John Coyne, head of the Border Security Program at the Australian Strategic Policy Institute (ASPI), said some regimes have been emboldened by the West’s inaction. “If I said to you a decade ago that the Russians would kill two of their citizens on UK soil, one with a chemical agent and the other using a radioactive agent, you’d think I was reading from the script of a James Bond film,” Dr Coyne said. “If I told you North Korea would poison one of its citizens in a major airport using a chemical agent, you’d think it wasn’t possible.”Earlier this month, president of Interpol Meng Hongwei was detained by Communist Party authorities during a visit to Beijing. The Chinese national hasn’t been heard from since and his wife now fears he is dead. “If I’d raised that as a remote possibility a decade ago, you’d think I was crazy, just as you would if I told you the Saudis would kill one of their citizens in one of their embassies and chop him up into pieces. He blames the slow international response to major, high-profile incidents for a growing confidence felt by certain regimes.There is evidence that Russia was involved in the shooting down of (Malaysian Airlines flight) MH17 and they copped a few sanctions and not much else. Russia and North Korea’s assassination activities, barely anything,” Dr Coyne said. Prof Medcalf said states like Russia tended to favour short-term and highly disruptive acts while China was very carefully and strategic playing a “long game”. “A lot of it is about cultivating individuals, not for immediate use but to support China’s interests in the long run,” he said. In May, Mr Lewis told the Senate that foreign states have maintained an interest in attempting to sway key figures in public and private life in Australia. Their efforts often appear harmless and friendly, but could have significant consequences down the track, the ASIO chief warned. “Foreign (individuals) covertly attempt to influence and shape the views of members of the Australian public, the Australian media, officials in the Australian government and members of the diaspora communities here in Australia,” he said.Former Labor senator Sam Dastyari was embroiled in two scandals involving dealings with a Chinese businessman who was linked to the Communist Party. Mr Dastyari was sensationally forced to quit the shadow frontbench in 2016 when it was revealed Huang Xiangmo had paid some of his bills, as well as being a campaign donor. Then in 2017, he left politics all together after revelations he told the man his phone was likely being tapped, including by US intelligence agencies. Mr Dastyari has denied any deliberate wrongdoing.I think the two Dastyari affairs drove change,” Prof Medcalf said. “Before that, there was a degree of naivety in the political class and a degree of denial. Political parties had become disturbingly dependent on foreign funding. That is changing. Professor Medcalf claimed China operated entire departments whose goal is “to co-op and exploit goodwill and friendly voices in foreign countries in order to increase China’s power and influence” abroad. “That’s all kinds of seemingly innocent friendship societies and business lobby groups and so forth, but it provides a bridge for long-term Chinese influence,” he said.Another concern is China’s cash splash in the Pacific region, pouring significant amounts of money into infrastructure and nation-building projects. Some fear the goal is to ensure long-term influence over countries that would normally be staunch allies of Australia.n its last Budget, the Government announced the biggest-ever foreign aid package to Pacific nations, seen as a way of countering China’s activities. The commander of the US Army in the Pacific region, General Robert Brown, told a conference in Canberra earlier this year that there were strings attached to the gifts from China, which should worry the West. And in September, it was revealed Australia is developing plans with Papua New Guinea for a joint naval base on Manus Island after China took an interest in four major port redevelopments across PNG. Another key strategy for China has been purchasing or investing in infrastructure projects in strategically positioned regions like Australia. Chinese companies have been on a spending spree across the country for years, snapping up everything from housing and industrial sites to major ports in Darwin and Melbourne. It spent a whopping $1 billion buying Aussie agricultural assets in 2017. “The purchase of critical infrastructure by state-owned companies essentially sells off our strategic assets and puts them at the whim and control of a foreign power,” Dr Coyne said. The telecommunications giant Huawei was blocked from bidding to develop and rollout Australia’s 5G mobile network due to security concerns.According to ASPI cybersecurity expert Tom Uren, it would have been impossible to employ Huawei without some degree of risk. “The main concern is that they could covertly intercept our communications and get access to our devices — computers, phones, anything with a signal,” Mr Uren told news.com.au in June. On the back of the decision, Shahar Hameiri, associate professor at the School of International Politics at the University of Queensland, said the Government was obviously scrambling to curb China’s spending in Australia. “Scrutiny of the national security implications of infrastructure has been upgraded,” he wrote for The Conversation. “The new Critical Infrastructure Centre is assisting the Foreign Investment Review Board in this. Though not made explicit, the main focus is China. The Federal Government passed sweeping foreign interference laws in June in a bid to respond to the growing problems identified by security agencies. It’s hoped the laws will produce a stronger deterrence effect, but Prof Medcalf said the problem won’t disappear any time soon. “One of the big challenges is that foreign states have tried to make use of individuals within communities here,” he said. “The intimidation of Chinese community groups in Australia and the propaganda direction of some of the Chinese language media are potential risks.”In September, The Australianreported that Chinese students at the University of Adelaide were targeted for appearing to campaign against communism. “It has been alleged that some Chinese students who ran on an International Voice ticket for board positions of the Adelaide University Union threatened and intimidated other students from China who were campaigning for the rival Progress party,” the newspaper said. It alleged some foreign students were told they would be reported to the Chinese Embassy in Canberra if they became involved with the student elections. In the United States, intelligence agencies are becoming increasingly concerned about Chinese influence at universities across the country. More than 100 higher education institutions are in partnership with the Communist Party indirectly via state-sponsored Confucius Institute, the Washington Post reported. “The US intelligence community is warning about their potential as spying outposts,” it said. And the magazine Foreign Policy reported that Chinese students attending American colleges felt fearful of Beijing’s growing influence. “That pressure has become more apparent since 2016, when the Chinese Ministry of Education issued a directive ordering schools to instil greater patriotism and love for the party in students of every age — including Chinese students studying abroad,” the publication reported.China’s concern about its expats activities extends to the religious movement Falun Gong, according to Clive Hamilton from the Centre for Applied Philosophy and Public Ethics at Charles Sturt University. “Chinese authorities in Australia are monitoring Falun Gong practitioners on the streets of Sydney and Melbourne, photographing anyone who interacts with them,” Prof Hamilton said. Controlling members of the Chinese community in Australia seemed to be a major priority, Prof Medcalf said. “We’ve got a large and diverse number of Chinese communities — 1.2 million people approximately — and the Communist Party wants to silence descent and criticism. In order to stay in power, the Chinese regime needs complete content from its own population. Efforts to weaken Western liberal democracies by foreign powers aren’t confined to far-flung battlefields or horrific terrorist attacks like they once were. Nations, including Russia, are taking their efforts to the web, with units of hackers and teams of astro-turfers seeking to both discover as well as distort information. “News and facts have been hijacked by new forms of distribution messages to reach out and shape views across the world, which can have an impact on the foundation of democracy,” Dr Coyne said.The alleged interference by Russia in the US Election is the subject of multiple high-level probes there. Dr Coyne said Australia’s intelligence agencies would be closely monitoring the next federal election to prevent any potential interference. “The American experience has been a wake-up call,” he said. Other forms of cyber warfare target intellectual property and classified information. Chinese hackers were blamed this year for several months of relentless attacks on computer systems at Australian National University, which is home to defence-focused research teams. An unnamed foreign intelligence service was also the culprit for a 2015 malware attack on the Bureau of Meteorology, officials said. Russian-backed hackers have been accused of attempting to infiltrate computer networks housing the official investigation into the downing of MH17, as well as the global nuclear regulation authority, earlier this year. But what is the actual goal of this new and unprecedented era of espionage, particularly for a participant as active as China? “It differs from country to country but I think there are three or four key objectives for China in respect to Australia,” Prof Medcalf said. “China wants to weaken the Australia-US alliance to reduce the possibility that Australia would support America in a conflict in the Asian region. “It’s also trying to silence Australia’s independent voice in the Indo-Pacific region to make it less critical of Chinese policy. Many countries in South-East Asia look to Australia to be a solid voice. If that can be silenced, other voices can potentially be silenced as well.”China also has an interest in growing its technological advantage in both a military and civilian sense, and Australia is home to both quality, cutting-edge research and sensitive materials shared by allies. “And as I’ve pointed out, the final goal is to do with seeking to control Chinese communities in Australia,” Prof Medcalf said. When the ASIO boss addressed the Senate in May, it was one of several recent strong-worded statements about foreign interference. His stance has been seen as a way of keeping awareness on the issue but also sending a message to foreign agencies that Australia is watching. “Foreign states maintain an enduring interest in a range of strategically important commercial, political, economic, defence, security, foreign policy and diaspora issues,” he said.r Coyne said Australia and its intelligence agencies are responding to the problem but a bipartisan approach from political players is required. “It’s hard for foreign interference to occur in the daylight. We need to shine a light on these activities,” he said. pt im as disappointed in the libs as you are with dastyari and labor. Labor got rid of Dastyari for taking money from Chinese. Libs...not so much. nah pt, dastyari did a bit more than that. he had become a security risk. How could you have someone in the parliament when they are informing a "potential" hostile government? What's happened to the vanished Uighurs of Xinjiang? The government denies the claims, saying people are willingly attending special “vocational schools” which combat “terrorism and religious extremism”. On 12 July 2015 a satellite swung over the rolling deserts and oasis cities of China's vast far west. A massive, highly secure compound had materialised from nothing in less than three years. It is enclosed with a 2km-long exterior wall punctuated by 16 guard towers.The first reports that China was operating a system of internment camps for Muslims in Xinjiang began to emerge last year. It places the site just outside the small town of Dabancheng, about an hour's drive from the provincial capital, Urumqi. To try to avoid the suffocating police scrutiny that awaits every visiting journalist, we land at Urumqi airport in the early hours of the morning. But by the time we arrive in Dabancheng we're being followed by at least five cars, containing an assortment of uniformed and plain-clothes police officers and government officials. It's already clear that our plan to visit a dozen suspected camps over the course of the next few days is not going to be easy.As we drive up the wide approach road we know that sooner or later the convoy behind is going to try to stop us. 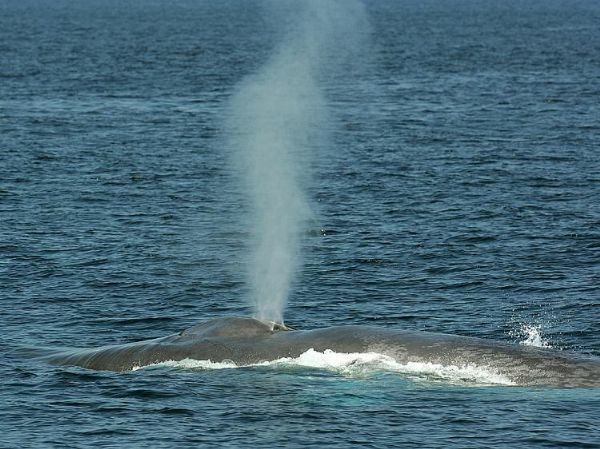 While still a few hundred metres away, we see something unexpected. The wide expanse of dusty ground, shown on the satellite image to the east of the site, is empty no more. In its place, a huge extension project is taking shape.An October 2018 Sentinel image shows just how much the site has grown compared with what we'd expected to see. What we suspected to be a big internment camp, now looks like an enormous one. And it is just one of many similar, large prison-type structures that have been built across Xinjiang in the past few years. Before our attempt to visit the site, we'd stopped in the centre of Dabancheng. It was impossible to speak openly to anyone - minders lurked menacingly close by and would aggressively debrief anyone who even exchanged a greeting with us. Instead, we telephoned random numbers in the town. What was this large complex with its 16 watchtowers that the authorities were so desperate to stop us filming? “It's a re-education school,” one hotelier told us. “Yes, that's a re-education school,” another shopkeeper agreed. This giant facility would of course fit no objective definition of a school. In Xinjiang “going to school” has come to take on a meaning all of its own.China has consistently denied that it is locking up Muslims without trial. But a euphemism for the camps has long existed - education. Almost certainly as a response to the mounting international criticism, the authorities have begun to double down on this description, with a full-on propaganda drive. State-run TV has been showing glossy reports, full of clean classrooms and grateful students, apparently willingly submitting themselves to the coursework. The video suggests the school is operating a dress code - not a single one of the female students is wearing a headscarf.There are more than 10 million Uighurs in Xinjiang. They speak a Turkic language and resemble the peoples of Central Asia at least as much as they do China's majority population, the Han Chinese. The southern city of Kashgar, it is often pointed out, is geographically closer to Baghdad than it is to Beijing - and it sometimes feels culturally closer too. And with a history of rebellion and resistance to Chinese rule, the relationship between the Uighurs and their modern-day political masters has long been as fraught as it is distant. Before Communist rule, Xinjiang occasionally slipped from China's grip with brief periods of independence. Ever since, it has constantly tested that grip with sporadic outbreaks of protest and violence. The mineral wealth - in particular oil and gas - of a region almost five times the size of Germany has brought huge levels of Chinese investment, rapid economic growth and large waves of Han Chinese settlers. Resentment among Uighurs over the perceived uneven distribution of the proceeds of that growth has simmered. In response to such criticisms, the Chinese authorities point to rising living standards for Xinjiang's residents. I wonder what Docs views on that one are Isaac. more to the point, what are your thoughts softy? American spy agencies, the officials said, had learned that China and Russia were eavesdropping on the president’s cellphone calls from human sources inside foreign governments and intercepting communications between foreign officials. The officials said they have also determined that China is seeking to use what it is learning from the calls — how Mr. Trump thinks, what arguments tend to sway him and to whom he is inclined to listen — to keep a trade war with the United States from escalating further. In what amounts to a marriage of lobbying and espionage, the Chinese have pieced together a list of the people with whom Mr. Trump regularly speaks in hopes of using them to influence the president, the officials said. Where does it say that Chinese and Russians listened to Obama and Clinton using unsecured phones? They are saying that security agencies aren't particularly concerned about the Chinese listening to Trump because he is an idiot and as reported many times, serious security stuff is withheld from him, so all he talks to and about on his phone is his 2AM calls his nutjob conspiracy stuff with his chief advisers Hannity, Alex Jones and Breitbart and Trump telling the Chinese saves them engaging in covert disinformation programs with them. "nutjob conspiracy theories"? isnt that you pt? Isaac, you do know Alex Jones and those others are just performance artists, dont you? They are taking the p1ss out of gullible RWNJ fools. They are making money off your fragility. The great projector.....ready made Trumpanzee. whale and pt are obviously lost for words and original ideas. PET CULLS ARE A SYSTEMATIC ASSAULT BY CCP TO CRUSH ANY COMPASSION OR EMPATHY AMONGST THE CITIZENS. Dog owners are left sobbing on the ground, in pools of their pet dog’s blood as official Dog Beaters laugh in their face. Dog owners do not even have the dignity of burying their pet, which is thrown onto a lorry of beaten, broken and bloodied dog corpses. Beaten dogs are often not killed outright, but left to die slow agonised deaths on the corpse-lorry. Pleading and begging owners are met with violence. Walking your pet dog on a leash in big cities such as Beijing and Shanghai, if your stopped by authorities known as “Chengguan”, you must IMMEDIATELY produce a current dog license or you will be forced to the ground and held down while your dog is beaten to death with a bamboo pole, before being thrown onto a wagon of already bludgeoned dogs and carted away as trash. It doesn’t matter if your a local or a foreigner, the Dog Beaters couldn’t care less. for more proof ... google or search "pet culls in china" in YT. this video is a slide-show, no audio, not too graphic, with much information on the current pet cull assault. CCP's "Official" excuse is "rabies" , but we suspect this is just more CCP terrorism. CCP is threatened by the instability that would occur if the Chinese discovered COMPASSION thru loving their pets. China has a long history of beating pets to death to cull dogs. Yesterday in Yunnan Pu’er City urbnan management representatives beat to death a number of dogs, including loved pets. The poodle in the video was clearly someone’s pet. It was well groomed and wearing an expensive harness, as shown in the top left hand corner of the photograph. The black dog in the video was bludgeoned to death because it barked in a public place. It is wearing a house collar. These deaths took place in Simao District, Pu’er City, Yunnan Province. The telephone number for the city council is: Urban Management Office Tel 0879-2161228, Pu’er City Mayor Hotline 0879-12345. A Chinese animal lover reported on Chinese social media that when they contacted city council they were told no dogs were being killed. They were told the dogs were being taken to a shelter to be adopted. This is clearly not the case! PETA would ultimately like the same end result but without the part in the middle. Not too dissimilar to racial segregation in my thinking, by whatever means.